Each alliance believes that the combined vote share of individual parties can defeat the other side. But is that likely to work in a post-Karunanidhi, post-Jayalalithaa political era? Elections, they say, very often boil down to arithmetic. Tamil Nadu’s political parties have been quick to draw their battle lines, picking their side even though the Election Commission is yet to sound the poll bugle for the 2019 General Elections. The ruling AIADMK, which looked friendless just weeks ago, will go into the Lok Sabha Election with the BJP and PMK by its side. Driving a hard bargain, Vijayakant’s DMDK may also jump on board the AIADMK+ bandwagon. Chief Minister Edappadi Palaniswami and co are also counting on smaller parties like GK Vasan’s Tamil Manila Congress (TMC), Dr K Krishnaswamy’s Puthiya Tamilagam (PT), and the Indhiya Jananayaga Katchi (IJK) to shore up the alliance. On the other side, the DMK led by MK Stalin has firmed up an alliance with its trusted ally the Congress. The Left parties, the VCK, and the MDMK, are also a part of the alliance with seat sharing talks still underway. AIADMK + BJP + PMK + DMDK + TMC + PT + IJK, versus DMK + Congress + VCK + MDMK + CPI(M) + CPI. Each alliance believes that the combined vote share of the individual parties can defeat the other side in the parliamentary polls. But is that likely to work in a post-Karunanidhi, post-Jayalalithaa political era in the state? Although the DMK improved its performance in the 2016 Assembly Elections, gaining a vote share of 31.6%, it was not enough to beat the Jayalalithaa juggernaut. Its ally, the Congress, saw its vote share dip in 2016 recording 6.4%. CPI, CPI(M), VCK and MDMK which were part of the People’s Welfare Front had a vote share of 0.8%, 0.7%, 0.8% and 0.9% respectively. DMK’s alliance would then have a combined vote share of 41.2%. Based purely on the 2016 performance, it appears that the AIADMK alliance has the numbers. But let’s not forget state elections are different from Parliamentary elections. The stakes are different for voters and for political parties. 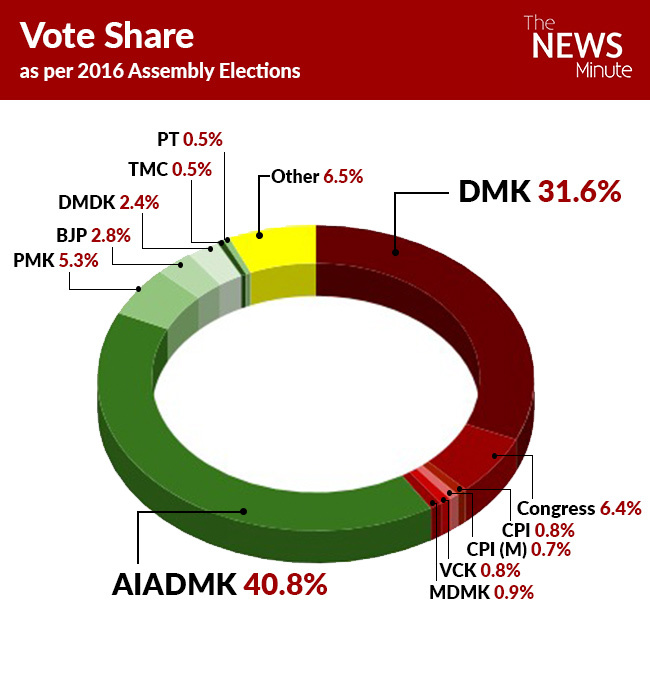 If one were to go by the 2014 Lok Sabha Elections, the AIADMK’s mega alliance with a combined vote share of 59.9% would defeat the DMK combine (33.9%) by a huge margin. Jayalalithaa, whose Prime Ministerial ambitions were well-known, had swept the polls in 2014 winning 37 out of the 39 seats in Tamil Nadu. The DMK was routed, failing to win a single seat. But the fact of the matter is, AIADMK and DMK are very different political sides going into 2019. The absence of Jayalalithaa and Karunanidhi for the Dravidian heavyweights is likely to have a significant impact on their respective vote shares. The question, however, is how much? The threat of an eroding vote share is more real for the AIADMK under Edappadi Palaniswami, given that Jayalalithaa’s one-woman campaign across the state in 2014 had swung the elections in favour of the two-leaves symbol. Add TTV Dhinakaran and his AMMK into the mix, which is likely to take away a sizeable chunk of AIADMK’s vote share. Also, factor in anti-incumbency for the AIADMK at the state and BJP at the Centre and the formidable alliance’s arithmetic further falters. 2019 should be MK Stalin’s for the taking. But a number of factors weigh down the DMK alliance. Despite A Raja and M Kanimozhi being acquitted in the 2G case, the DMK has not been able to shed the tag of corruption. With A Raja, Kanimozhi and Dayanidhi Maran expected to get a seat in the Lok Sabha Elections, the AIADMK and the BJP will no doubt target the DMK-Congress alliance over corruption during the UPA era. With Jayalalithaa no longer on the electoral scene, the anti-AIADMK votes should go to the DMK. But it may not be so simple. While TTV Dhinakaran could split the AIADMK’s vote, he may end up playing spoilsport for the DMK as well. Actor-turned-politician Kamal Haasan, who will be making his political debut, has bravely declared that his MNM party will contest all seats. And while the DMK-Congress may brush aside Kamal Haasan’s political significance, the alliance should be cautious not to underestimate the actor’s potential to take away the ‘secular vote’ – especially in constituencies where it could go down to the wire. In many ways, parties and poll pundits in Tamil Nadu are going into the Lok Sabha elections blind – much of the state’s electoral past may come to nought at the ballot box. So, while, the AIADMK may have chosen to announce its alliance with the PMK and the BJP on Tuesday after ‘Rahu kaalam’ on an ‘auspicious day’, EPS and the mega alliance will need much more than the stars aligning for its electoral arithmetic to add up on polling day. And Team DMK-Congress cannot rest easy in the belief that anti-incumbency will work in their favour.